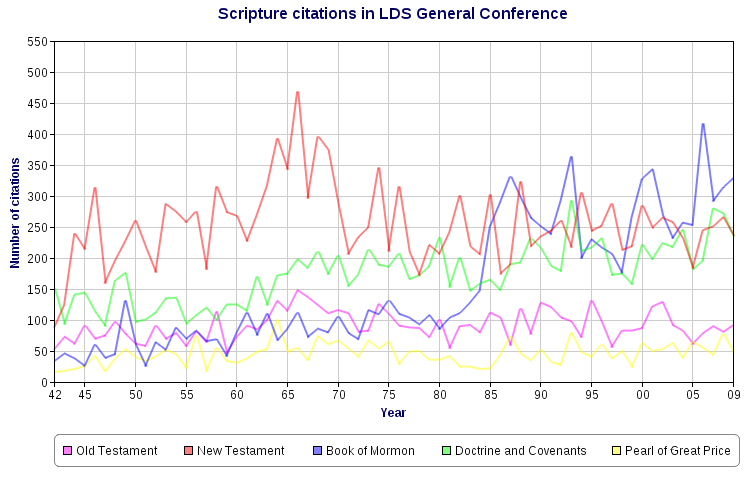 Someone recently referred me to Brigham Young University’s online LDS Scripture Citation Index, a database of scripture citations from General Conference (an event, held twice a year, in which the top leaders of the Church of Jesus Christ of Latter-day Saints give speeches addressed to the general membership), and, just as I usually do when presented with a lot of data on a topic that interests me, I proceeded to waste far too much of my rather limited free time crunching numbers and looking for interesting patterns. 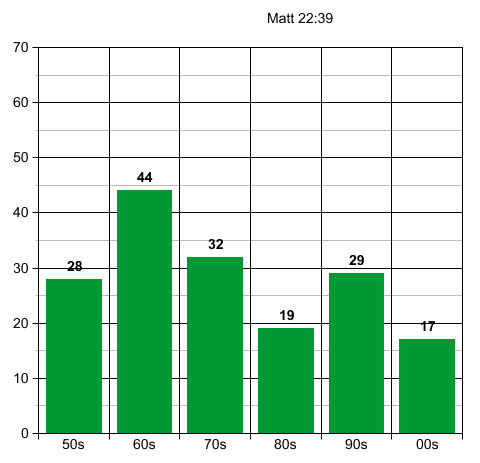 As you can see, the Book of Mormon, which had previously been languishing in Pearl-of-Great-Price-like obscurity, suddenly shot to the top in 1985, since which time it has been cited about as frequently as the New Testament (formerly the undisputed top dog) and Doctrine and Covenants. 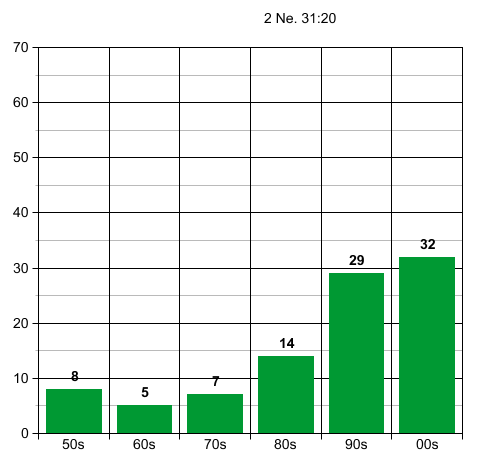 What happened in 1985? Ezra Taft Benson. It’s also interesting to look at the changing fortunes of some individual verses. 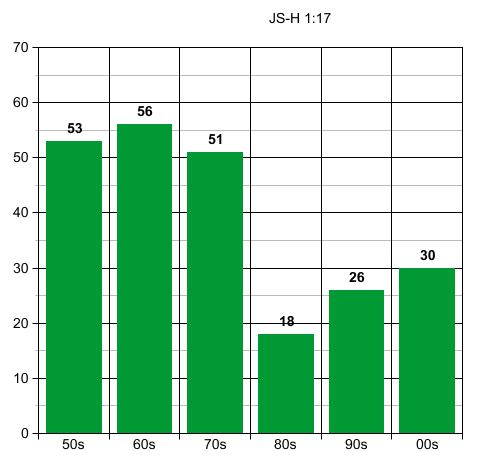 The tables below show the number of citations per decade for eleven especially prominent passages. 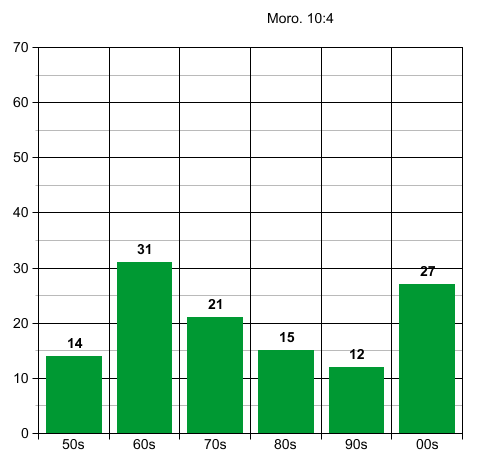 These eleven were chosen because each of them has had at least one decade in which it was cited 30 times or more. 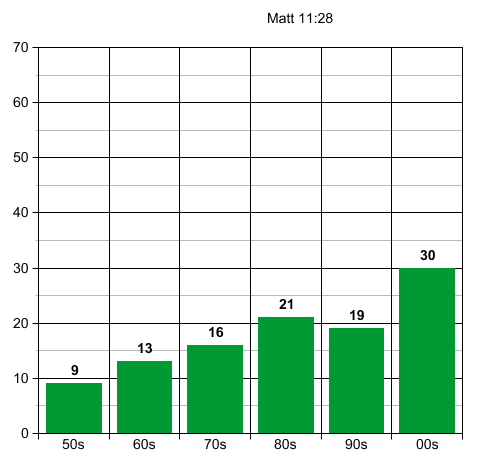 Matthew 11:28 has been steadily rising in popularity and is the only Bible verse to have reached the 30-citation mark in the post-Benson era. 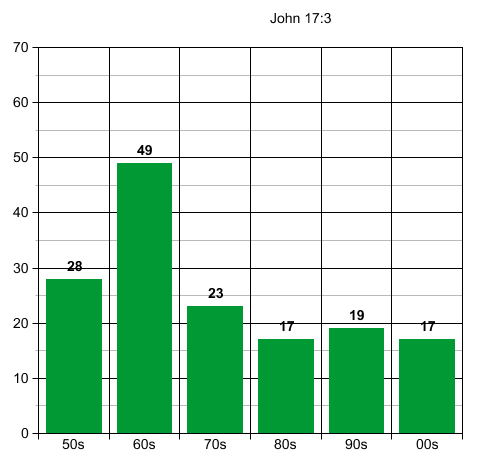 Matthew 22:39 and John 17:3 both peaked in the sixties and have been declining — but not dramatically — since. 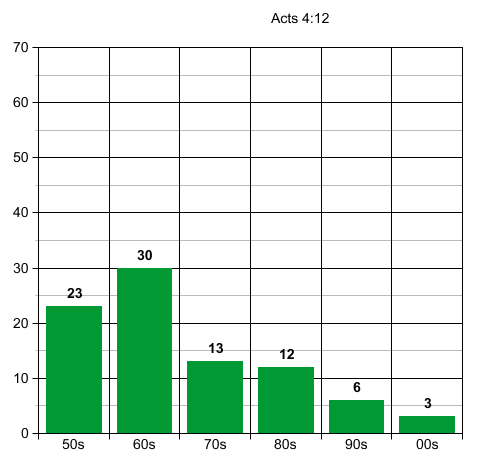 Acts 4:12, which also peaked in the sixties, is clearly on the way out. 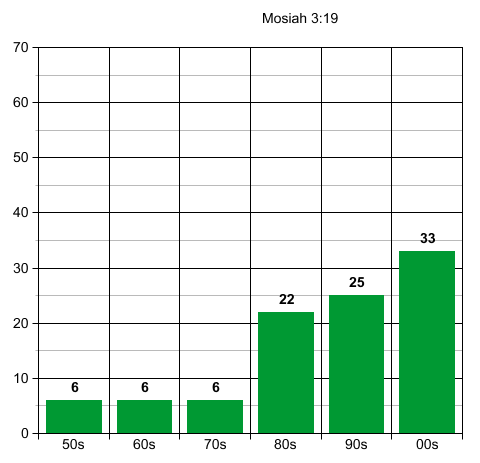 These three verses from the Book of Mormon — 2 Nephi 31:20, Mosiah 3:19, and Mosiah 18:9 — all leapt to prominence in the Benson era and have been popular ever since. 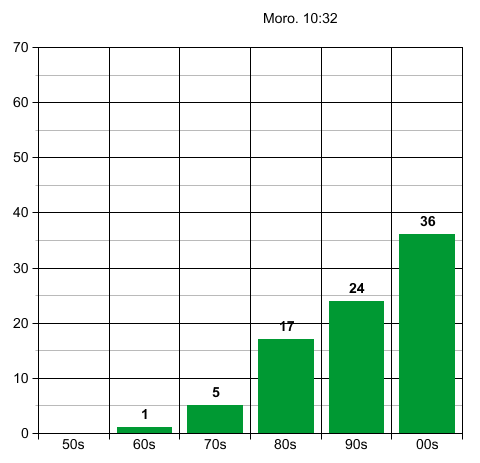 Moroni 10:4 is the only Book of Mormon verse to have reached the 30-citation mark before Ezra Taft Benson. It actually dropped in popularity during his tenure, though it seems to be making a comeback. If scriptures were stocks, this would be the one to invest in. It’s gone from zero to 36 and shows no signs of slowing down. I’m not sure what exactly that says about the Mormon zeitgeist, since it seems like a pretty nondescript verse to me. 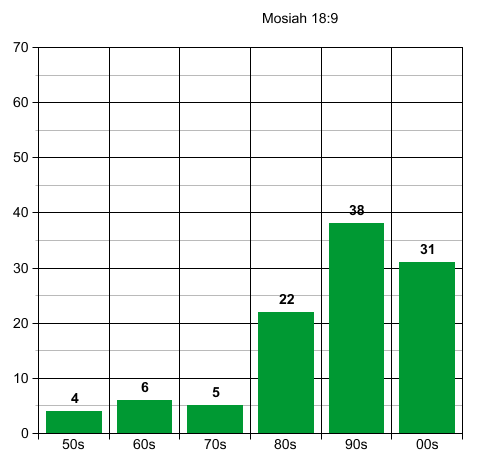 Although the Pearl of Great Price is consistently Mormonism’s least-cited book of scripture, the two heavyweight champion verses — Moses 1:39 and Joseph Smith History 1:17 — both come from it. 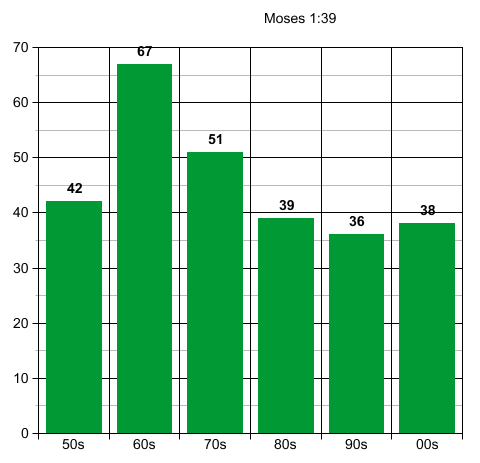 Moses 1:39 is the only verse to have been cited at least 30 times in every one of the six decades. Down on the shoreline live the most extraordinary of the island’s many strange inhabitants: marine iguanas, the only saltwater lizards in the world. They eat algae — seaweed — growing on rocks between the tides, so they have to wait for the water to go down before they can feed. They live only on shores exposed to cold currents. The arrival of the cold water is a double-edged sword. Its nutrients stimulate the growth of the algae they eat, but because the lizards are cold-blooded, cold water slows them down and could even kill them. The best algae grow lose to the low tide mark, so it’s a race to eat all they can before the rocks are covered again and their bodies are chilled to danger point. Strong claws and a good grip are essential if you’re not to be swept away. For most iguanas, life is ruled by the tides, but the big males have another option. Below the low tide mark, the growths of algae are more luxurious because the rocks are always covered. The males use the heat of the tropical sun to exploit them. They expose the greatest possible surface to its warming rays. Because their bodies are larger, they can store more heat and don’t chill down so quickly. When they’ve warmed to an optimum of 25 [or 35? unclear pronunciation] degrees, they take to the water. Down here they can take advantage of a food supply that’s out of reach for the smaller iguanas. They can hold their breath for 20 minutes or more, but they have to feed fast. Every minute they spend here, the heat is draining from their body. If their temperature falls too low, they’ll be unable to move, and they’ll die. It’s time to go. So why is cold-bloodedness such a big problem for iguanas but not for fish? At first I thought it might have something to do with the antifreeze proteins some fish (but not reptiles) have — but antifreeze proteins are only for dealing with water so cold that it would otherwise literally freeze a fish’s blood, and, according to this map, the sea around the Galapagos, while certainly a bit chilly by equatorial standards, isn’t anywhere near cold enough for freezing to be an issue. According to the range map here, cold-blooded sea turtles seem to do just fine without antifreeze both in the Galapagos area and in waters a good 10 degrees cooler. So far I haven’t figured this out — this post has been in my drafts folder for quite some time now waiting for me to find the answer — but I’m going to go ahead and post it in hopes that some knowledgeable person will happen upon it and leave an enlightening comment. I’ll keep reading and thinking and post again if I find anything that sheds any light. In the meantime, here are some more entertaining marine iguana clips. The Book of Eli: Why Eli? As for the movie itself, it was a bit of a wash, despite the considerably talent of Denzel Washington and Gary Oldman. The whole post-apocalyptic thing has been done to death and doesn’t make any more sense this time around. (Shoes and drinking water are hard to come by, but sunglasses and high-tech weaponry — including the occasional conveniently book-shaped time bomb — apparently grow on trees.) And although the central theme has a lot of potential, the movie doesn’t really deal with it very well. We never really get a sense of what Carnegie would be able to do if he had a Bible which he isn’t already able to do anyway.